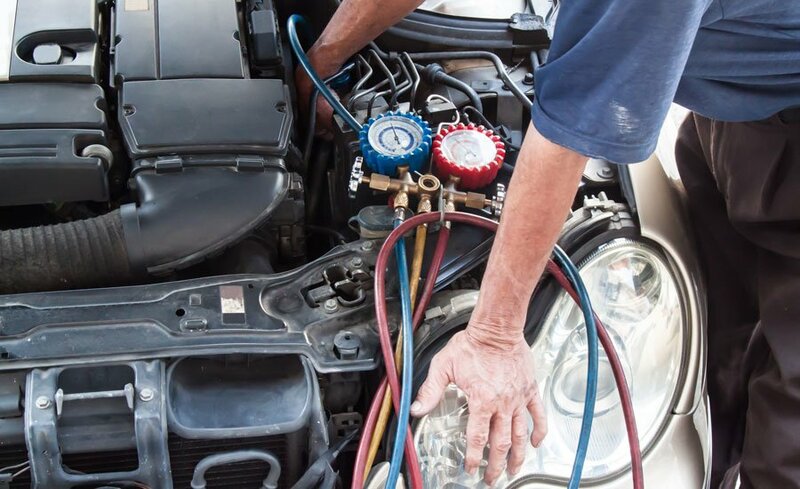 If you are searching for “ac compressor repair“, “ac compressor replacement“, “car ac compressor repair“, “car ac compressor rebuild near me“, “auto ac compressor repair” or “car ac compressor repair near me“, the ASE Certified Auto Technicians at Bridwell Automotive Repair can help! After your bring your car in for an inspection, Bridwell Automotive will diagnose the problem with your car a/c compressor and provide repair options. Our automotive ac compressor repair and replacement technicians provide car a/c compressor repair, replacement and rebuilding. If your ac compressor only has a broken part or 2 we can fix it with our professional car a/c compressor repair services. If your car’s a/c compressor cannot be repaired or rebuilt, we can replacement it. We provide affordable car a/c compressor replacement services. We offer car a/c compressor rebuild services to help rebuild your car’s ac compressor with brand new parts. Not Sure It’s The AC Compressor? 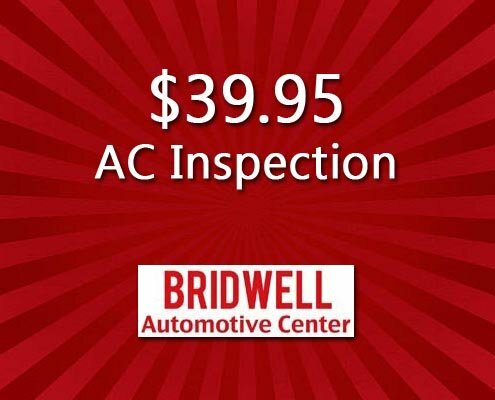 Schedule an AC Inspection with Bridwell for just $39.95. Our ASE Certified technicians will inspect your AC system to find why it’s not working properly and recommend affordable repairs. One of the most common problems is that the clutch will burn our or sometimes the bearings will fail. If the bearings or clutch is shot it is usually necessary to replace the AC compressor. In most cases it is more cost effective to replace the compressor instead of trying to order parts and repair one. Other problems that AC compressors have is bad Ac seals which will leak AC oil or refrigerant. There is no way to replace seals on an AC compressor, so replacement is necessary if this is the problem. There are signs that point to AC compressor problems such as sludge or debris in the AC system. A flush might remove the sludge or debris but if it can’t a replacement may be best. There are 11 common signs that are common with AC compressor issues, read about them below. If you have noticed any of these signs in your vehicle schedule an appointment today to diagnose what’s preventing your AC system from working correctly. Bridwell always strives to ensure that the problem is found fast and affordable repairs are offered and performed in the most professional and efficient way possible. The AC Compressor is made up of various parts such as pistons and valves. Over time wear will cause these parts to stop working and your AC compressor to need repair or replacement. For an AC compressor to function properly you need an electrical connector, clutch, and bearing that’s in good working condition. A serpentine belt controls the clutch which engages the AC compressor when you turn on your vehicle’s AC system. The compressor is the very beating heart of your car air conditioning system. It’s job is to compress and transfer the refrigerant through the system. It’s fastened to the engine and is driven by the serpentine belt or chain, depending on your vehicle model. AC systems are divided into high and low pressure sides. The AC compressor functions as a pump in your car’s air conditioning system and therefore must have a intake and a discharge side. The intake of the AC compressor pulls the refrigerant in from the evaporator. The compressor then takes the refrigerant that came from the evaporator and compresses it into the condenser for heat transfer from the vehicle. The condenser is where heat dissipation happens. The condenser resembles in a lot of models of cars the radiator. They have about the same function to dissipate heat, one from the engine, the other as part of the AC system. In some models the condenser sits in front of the radiator, but not always. It’s important for the condenser to always have sufficient air flow either by air moving through the engine bay or with electronic fans. The job of the condenser is to take the hot refrigerant gas from the compressor and cool them off. As the refrigerant gases cool it condenses back into a high pressure liquid and exists the bottom of the condenser. The AC evaporator is inside your car and functions to absorb heat. It has several important functions as part of your AC system. The main focus of the evaporator is to take the heat out of your car. Another job the evaporator does is to remove humid air. As the warm air travels through the evaporator the moisture condenses on the evaporator coil’s aluminum fins. Pollen and dust also get removed via the evaporator and are drained outside your vehicle. The ideal operating temperature for the evaporator is freezing, or 32°F. The refrigerant that’s been condensed and cooled enters the evaporator as a low pressure liquid and quickly boils when it is exposed to the warm air from the vehicle. The boiling point for refrigerant is extremely low and it does the job of absorbing immense quantities of heat from the system. These are the general steps that our technicians follow when replacing an AC compressor. Some models and makes may have slight variations for the steps or extra steps. We stay current on all types of refrigerant, AC compressors, and equipment for all brands of cars, trucks, suvs, and vans. How Much Does Car AC Compressor Repair & Replacement Cost? The average cost of car ac compressor repair & replacement is around $889 with high costs around $1,100 and low cost around $600. However, specific costs will be determined on the make and model of your vehicle and how much labor is needed for the repair or replacement. *Disclaimer: These are not actual prices for your compressor repair or replacement. To get an estimate and learn how much your auto ac compressor repair or replacement will cost, schedule with Bridwell Automotive today! If you believe that your car AC compressor is suffering or is already broken give us a call and schedule an appointment for repair. Our team will find the problem with your ac system quickly, offer affordable repair rates, and complete any necessary repairs quickly and correctly. Schedule AC Car Compressor Repair by telephone at (480) 948-4781.